Against man coverage, a receiver will generally face one of two basic tactics at the line of scrimmage: press coverage or off-man coverage. When in press coverage, the defensive back will line up directly across from the receiver and be tasked with physically matching the receiver coming out of his break or off the line of scrimmage, with the goal being to disrupt the intended route. When playing off-man coverage, the defender gives some depth at the line of scrimmage, leaving a “cushion” between him and the receiver. This cushion makes off-man less vulnerable to deep routes than press-man, as it affords the defender much more room to break on the route and make a play on the ball. At PFF, the pre-snap alignment is one of the many things that we track during our analysis process. This practice lends data that we can use to evaluate how receivers fare when facing particular types of coverage. Using one of our Signature Stats, we will look at the NFL’s top receivers in WR Rating (passer rating when targeted) against both press and off-man coverage. 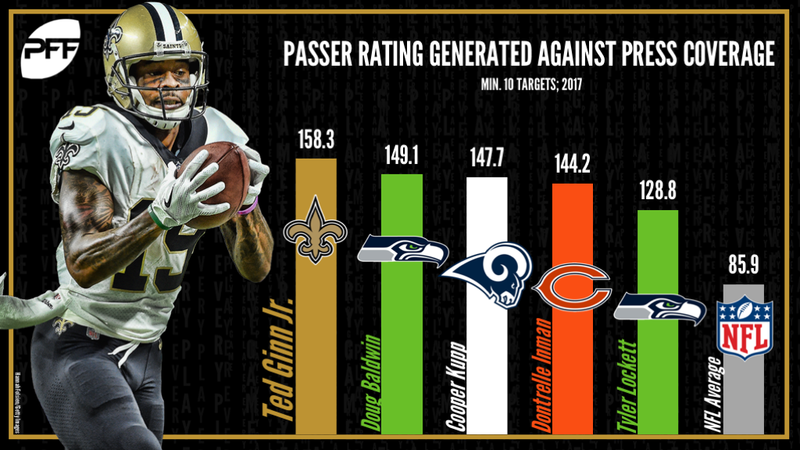 With Ginn’s blistering straight-line speed, it’s no surprise to see that defenses chose to play off Ginn at the line of scrimmage (69.9 percent of his routes), considerably more than they chose to press him (30.1 percent). However, Ginn took advantage of his opportunities against press coverage, as he ended the season with 15 catches on 17 targets for 304 receiving yards and three touchdowns. All told, he produced a perfect WR rating of 158.3 and recorded a catch rate of 88.2 percent, both of which ranked first among all receivers seeing at least 10 targets. Over the last few seasons, Baldwin has cemented himself as one of the most physical and explosive receivers at the line of scrimmage. Baldwin ended the 2017 season with 23 catches on 31 targets for 339 receiving yards and five touchdowns against press coverage, posting a WR rating of 149.1. Baldwin was also one of just seven receivers to see at least 30 targets against press coverage without dropping a single pass, and his average of 2.78 yards per route run against press coverage was the league’s fourth-best mark. Kupp had a really encouraging rookie season in 2017 and heads into his sophomore campaign as one of the league’s most promising slot receivers. Kupp rarely faced press coverage last season, but when he did, he used his shiftiness and athleticism to produce great results. Kupp caught 18-of-23 targets for 320 yards against press coverage, posting a WR rating of 147.7 and recording a catch rate of 78.3 percent, both of which ranked third among receivers with at least 10 targets. Even more impressive is the fact that a whopping 65.0 percent of Kupp’s press targets were positively graded, which was second only to Sterling Shepherd a season ago. The seven-year NFL veteran faced press coverage on 32.8 percent of his routes last season and proved to be one of the league’s most reliable pass-catchers in those situations. Inman tallied a catch rate of 80.0 percent against press coverage, with 70.0 percent of his press targets going for either a first down or a touchdown, both of which ranked second among receivers. He also posted a 144.2 WR rating on press targets, giving him the fourth-highest mark among receivers. The smaller-statured Lockett is a menace against press coverage. He finished the 2017 campaign with a WR rating of 128.8 versus press coverage, catching 75.0 percent of his targets for 125 yards and one touchdown, while averaging a very healthy 15.6 yards per reception. The rookie wide receiver faced press-man coverage on 40.3 percent of his routes in 2017 and caught 50.0 percent of his targets for 203 yards and two touchdowns. The star of the ‘Minneapolis Miracle’ caught 22-of-32 passes for three touchdowns and 281 receiving yards against press-man coverage. Allen faced press-man coverage on 49.1 percent of his routes in 2017, tallying the third-most receptions (43) and the third-most receiving yards (663) versus press coverage. He also averaged 2.90 yards per route run against press-man coverage, which was second only to Julio Jones. The former Raven caught 15-of-29 targets for 305 yards and three scores against press coverage, averaging an impressive 20.3 yards per reception. Agholor faced press-man coverage on 36.0 percent of his snaps, recording 20 receptions on 33 targets. He also tied for the third-most press-coverage touchdown receptions, with six. The fourth-year receiver saw slightly more off-man coverage (53.3 percent) than press-man coverage (46.7 percent) in 2017. 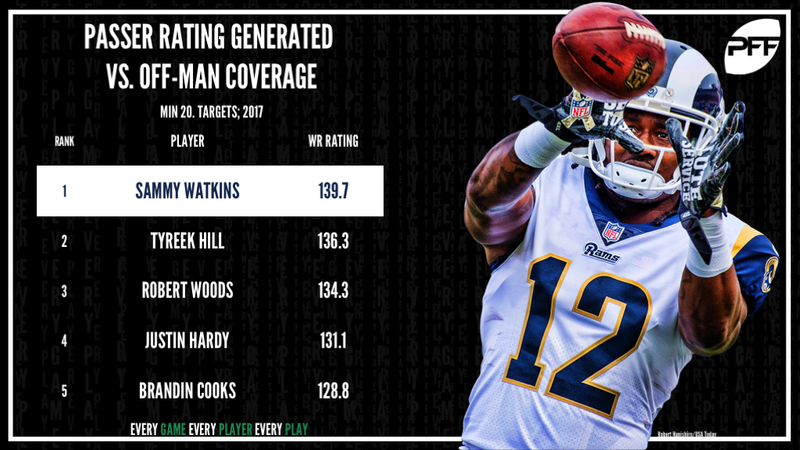 Watkins was especially effective against off-man coverage, as he caught 20-of-39 targets for 329 receiving yards and four touchdowns, giving him a league-best WR rating of 139.7. What’s more impressive, is that 61.3 percent of those targets ended with either a first down or a touchdown, also the league’s best mark. Watkins was one of just two receivers to see at least 30 targets against off-man coverage without dropping a single pass. As one of the league’s premier deep threats, Hill seldom sees press coverage. Last season, he faced off coverage on 65.0 percent of his routes, finishing the season with 61 catches on 78 targets and racking up a league-leading 924 receiving yards against off-man coverage. Woods took advantage of defenders giving him a cushion at the line of scrimmage in 2017, as he gained 608 receiving yards on 44 receptions against off coverage. He averaged 2.43 yards per route run against off-man coverage, ranking sixth among receivers with at least 20 targets and generated a WR Rating of 134.3, ranking third among receivers. Hardy dominated against off coverage in 2017. When given some space, Hardy caught 15-of-20 targets for 147 yards and two touchdowns, translating to a WR rating of 131.1. New England’s former deep threat faced more off-man coverage in 2017 (56.5 percent of snaps) than press-man (43.5 percent), likely due to Cook’s incredible straight-line speed. Cooks thrived against off-man coverage, as he ended the season with 41 catches on 61 targets for 739 yards. He also ranked fifth among receivers with an average of 17.9 yards per reception against off-man coverage. Jones Jr. racked up 619 receiving yards on his 32 targets against off-man coverage and led all wide receivers with an average of 19.3 yards per reception. In 2017, the Chargers wideout excelled against off coverage, as he finished the year with 25 catches on 40 targets and led the league with an average of 9.1 yards after the catch per reception. The speedy Fuller faced off-man coverage on 75.0 percent of his routes in 2017. On 32 targets, he managed 22 catches for 321 yards and four touchdowns. Smith-Schuster flourished as a rookie. Against off-man coverage, he caught 43-of-53 targets for 493 receiving yards and six scores, tying him for the most touchdowns versus off-man coverage. The now former Chief faced off-man coverage on 71.5 percent of his targets a season ago. He caught 34-of-45 targets for 432 yards and three touchdowns against off-man coverage, with 54.2 percent of those targets being positively graded, the fourth-best mark among wide receivers.